Charles Lloyd performs at the 2008 Souillac Jazz Festival in France. Photos by mpix46 via Flickr. JEFFREY BROWN: I was at that Washington concert recently, a wonderful concert. I wonder, how does it feel for you at 75 with these celebrations? Are you enjoying yourself, or some trepidation? How is it? CHARLES LLOYD: Very much so. It’s very touching for me, because the youngster in me is still alive and kicking. I was infected by music at a very young age, so it’s always kept me younger than springtime. I’m very blessed in spirit, and fortunately my health is good at this time. I’m looking upon it as being in service, and it’s amazing. You were there at the concert in Washington at the Kennedy Center, and it was amazing to see that place full of people. JEFFREY BROWN: Yep, it sure was. It was in the big theater, too. 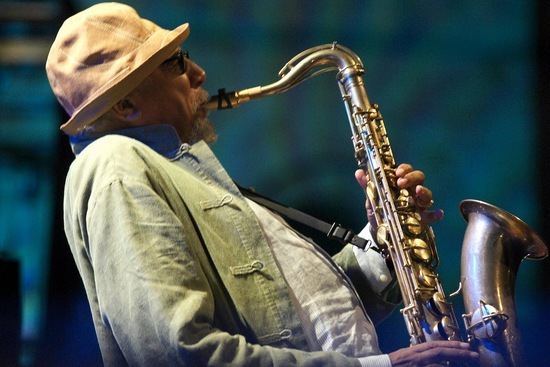 CHARLES LLOYD: Yes, the big one, yeah, 2,400, 2,500 seats. And then we played a week before that at Harvard, and we played Princeton, and we played a big concert at the Metropolitan Museum of Art in the Temple of Dendur, which was a very beautiful experience. I’m very blessed, I’m really thankful. JEFFREY BROWN: You mentioned getting the bug early in your youth. What was it? CHARLES LLOYD: I was born in Memphis. There was music all around me, really deep and special music. I heard all these great masters at a young age. Then there would be late-night radio, and then I’d hear Billie Holiday and Lester Young and Charlie Parker and all of that music. Then there was a great genius in my town, Phineas Newborn, who is one of the greatest pianists ever on the planet. He took me under his wings at about 9 and he put me on the right track. I played an amateur show, I won first prize, and I went into the wings and there was this guy, 16, standing there. He said, you need lessons bad. So illusions of grandeur were nipped in bud. He took me around the corner on Beale Street to a great musician, Irvin Reason, and he knocked on his door and he left me there. So all my life I’m trying to go forward and trying to grow. It is a music of freedom and wonder. It’s our indigenous art form, and I’m still blessed to travel around the world and people lay out the carpet for us, so it’s quite touching. JEFFREY BROWN: I was thinking about this at the concert, because you had the Greek singer Maria Farantouri, a different sort of genre, and I know you had your period playing with the Beach Boys. Do you think about, I don’t know, jazz as one thing or different genres — does it matter to you what you are playing? CHARLES LLOYD: I think when you love music, you love a lot of it. Now when it comes to jazz, it’s very much in the hyperions of height. You go exploring every night. With our indigenous music, you have slaves being brought to these shores and they had something, and the song blossomed here. The mixture of European harmonies and such and the rhythms of Africa and that beautiful melodic thing. For me, I was always moved by all of the music. As a young man, Duke Ellington and Lionel Hampton, Count Basie and all these great musicians would come through our town of Memphis. There wasn’t adequate hotels, so these musicians — the lady who ran the theater knew my mother, who had a large house, and many of them would stay with us. So that was another great blessing, so I’m always around these great geniuses, and to realize their humanity is such a touching thing. Mentioning Maria Farantouri, she’s someone who I found late in life, maybe 10 or 12 years ago. When I heard her sing, it affected me like those light-night radio shows with Billie Holiday, where I’d be drunk with the idea that she was singing to me and I’d better get to New York soon and marry her and take care of her. So I hear Maria Farantouri singing a different song at a different time, but it touched my heart in that same kind of way. But as to answer your question, lines of demarcation don’t really interest me as much as quality. JEFFREY BROWN: Let me ask you about the latest recording, the one with Jason Moran, a beautiful, beautiful album, by the way. I’ve been listening to it quite a bit myself. You’ve done this a lot where you play in a duo setting. You like that? CHARLES LLOYD: This thing with Jason, you know, I found out about my great, great grandmother a year or two ago that she at 10 years old had been taken from her parents in the south of Mississippi and taken up to Bolivar, Tenn., and sold for $300 into slavery, and this slave owner impregnated her at 14. It just tore my heart apart. This thing affected me so much. Jason and I are very close, and he plays in my quartet with Eric Harland and Reuben Rogers also. What happened was that I just had to somehow express something about — an homage to my ancients and to my elders. She lived in the early 1800s. But I also mixed it up with these Ellingtonians, Billy Strayhorn’s “Pretty Girl” and Ellington’s “Mood Indigo.” Jason Moran’s wife was in “Porgy and Bess” on Broadway, so I paid homage to her. I played “Bess, You Is My Woman Now.” I even played a Beach Boys song. And Levon Helms had died, and I played “I Shall Be Released,” because he was a dear friend and I knew them up in Woodstock. So it was an unfolding. You know, my music just pours out of me. So it was time to record and that playing in duo is really rare. Jason and I have done it in Maine and in Europe and in a lot of different places, but it’s kind of rare. The interesting thing is you’re naked, you just have to have this deep simpatico, and we have that. He’s a great soul and a great musician, as are all these musicians. I think that music makers just really bless the planet. It’s a beautiful thing. JEFFREY BROWN: Well, it is a wonderful recording. Once again, happy birthday. And I hope the celebration goes on and the touring continues forever and ever. Charles Lloyd, it’s great to talk to you. Thanks so much. CHARLES LLOYD: Thank you. And thank you for all you do for us, because us sensitives out here need you, too. JEFFREY BROWN: I appreciate that. Thank you all for joining us again on Art Beat. I’m Jeffrey Brown.